Cytokinins are complex class of plant hormones. The naturally occurring cytokinins include Zeatin (Z), iP (Isopentenyl adenine), and (Dihydrozeatin)DHZ and their ribosides zeatinriboside (ZR), iPA (Isopentenyl adenine riboside) and DHZR. In addition, conjugated (non-active) and phosphorylated (active) cytokinins have been isolated from plant tissues. For a long time, BAP has been considered to be a synthetic cytokinin, but has been recently shown a naturally occurring one. In addition to these cytokinins that are all of the purine-type, nonpurine cytokinins have been reported such as thidiazuron (TDZ) and CPPU (4-PU-30). These compounds have a very high cytokinin activity and are particularly successful in woody plants. TDZ is used commercially as a cotton defoliant. In this case, it acts by inducing ethylene synthesis. Meta-topolin is a highly active aromatic cytokinin that was first isolated from Populus. In tissue culture, BAP and the synthetic cytokinins kinetin and TDZ are most frequently used. The discovery of cytokinins is closely linked to tissue culture. In the starting period of plant tissue culture, it was observed that malt, coconut and yeast extracts promote both the growth and initiation of buds in vitro. Because these preparations all contain purines, nucleic acids were tested. It was observed that autoclaving of nucleic acids strongly enhanced their effect. The active compound formed by autoclaving appeared to be kinetin, a hitherto unknown purine. In 1964, Letham isolated zeatin from immature corn. 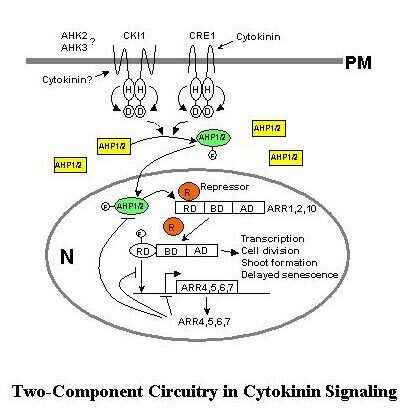 Cytokinins promote cell division, but they likely influence another step in the cell cycle than auxins. Thus, addition of cytokinins is usually required to obtain callus growth. In micropropagation, cytokinins are applied to promote axillary branching. High concentrations of cytokinin lead to extreme bushiness. This may result in undesirable bushiness long after transfer of micropropagated plantlets to soil. Transformation of plants with the cytokinin biosynthetic gene of A. tumefaciens may result in plants with reduced apical dominance. Other applications of cytokinin in tissue culture are promotion of adventitious shoot formation, prevention of senescence, reversion of the deteriorating effect of auxin on shoots, and occasionally, inhibition of excessive root formation (e.g., in germinating somatic embryos.). Cytokinins inhibit root formation and are therefore omitted from rooting media. Cytokinins may have other undesirable side-effects such as hyperhydricity and loss of the chimeric structure. 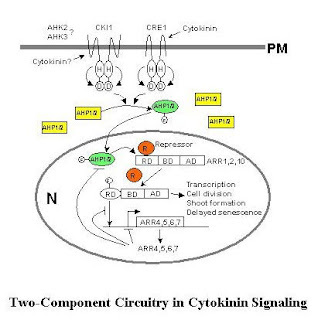 Transport, uptake and metabolism of Cytokinins. Roots are considered as the main site of cytokinin synthesis and cytokinins is transported to the shoot via the water flow in the xylem. Xylem exudates contain high levels of cytokinins. Recently, evidence has been found for active transport via carriers. When plant tissues are cultured on medium with cytokinins, they are rapidly taken up, although at a much smaller rate than auxin (3 to 10 times slower). It is not known how cytokinins reach target tissues like axillary buds (to break apical dominance) and leaves (to reduce senescence) which both are relatively large distance from the source but probably cytokinins are transported via water flow in the vascular tissues. Zeatin, ZR, iP and iPA are conjugated and/or oxidized by plant tissues. Oxidation involves oxidative side chain cleavage. DHZ, DHZR and BAP are conjugated but not oxidized. Cytokinins can be N-glucosylated on the purine ring or O-glucosylated on the N6-substituted side-chain. The N-glucosides are biologically inactive and stable. The O-glucosides, that are formed from Zeatin and DHZ may have a storage function. Just as with other plant hormones, aftger uptake only a very small percentage of cytokinin remains in the free form. TDZ is an exception and is conjugated only at very low rate: after long periods (12 to 33 days) of culture of Phaseolus callus on medium with radioactive labeled TDZ, 60% of the TDZ taken up from the mdium was in the free, non-conjugated form. BAP is chemically stable cytokinin in tissue culture medium, whereas most other purine-type cytokinins are considered to be to some extent chemically unstable. The nonpurine type cytokinins CPPU and TDZ are chemically stable. Compounds that influence cytokinin oxidation (phenolic compounds), conjugation and action, have been studed occasionally. They have hardly been used in tissue culture. The synthesis of cytokinins is inhibited by lovastatin or simvastatin In human medicine statins are used to lower cholesterol. You introduce the cytokinins in detail very much, but not refer to the difference between auxin and cytokinins. What are the effects of changes in their concentration on the plant and is it useful to do the adme studies on them?